Hidden Paradise Resort - Negril Jamaica's resort-style vacation accomodations across from the famous 7 miles white sands of Negril beach. A Negril Beach Experience you will never forget! Your home away from home in Jamaica. Hidden Paradise Resort Hotel, on Negril Beach, Jamaica. A great place to take your Jamaican honeymoon or vacation. The Hidden Paradise Resort Hotel is an 22 bedroom property nestled in a 1-acre tropical setting across the street from Mama Flo's (our private beach with bar and restaurant) on Negril's world famous 7 miles of white sand beach. On Jamaica's western tip, the beautiful and magical Negril Beach is THE place for lovers, honeymooners, couples, families, and others. Stay at the Hidden Paradise Resort Hotel to get the REAL Jamaica vacation experience! Spending your vacation in our family-run Negril resort will allow you to experience real Jamaican hospitality. We provide accommodations island style. A unique spot for a honeymoon, or even a wedding. 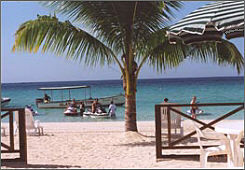 Our resort can accommodate your entire party in our Jamaica beachside hotel.